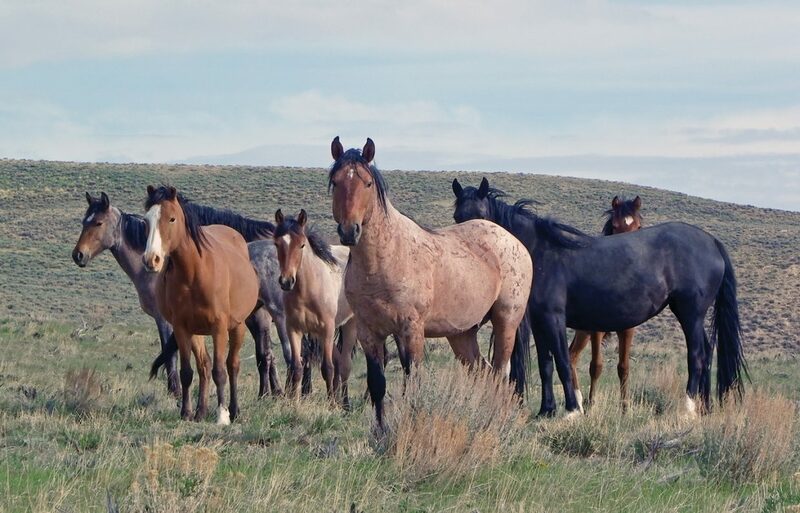 Bureau of Land Management and the newly formed nonprofit Piceance Mustangs are hosting a tour and barbecue May 5 to celebrate the wild horses of the Piceance-East Douglas Herd Management Area southwest of Meeker. When the Sand Wash Advocate Team, which collaborates with the Bureau of Land Management on wild horse issues, hosts a public meeting in Craig Aug. 5, the wild card in the room is likely to be the policy change being contemplated by the U.S. Congress, which could clear the way for the slaughtering of wild horses in an effort to check their population growth. The Denver Post and Associated Press reported July 19 that the House Appropriations Committee voted to reverse a ban on destroying healthy wild horses in a spending bill signed into law by President Trump in early May. Against that backdrop, the level of collaboration between the BLM and the Sand Wash Advocate Team stands out as a special case in the thorny problem of how to leave some mustangs on the arid grasslands of the American West while protecting the resource and allowing wildlife grazing. “I’d be surprised if someone doesn’t bring it up,” Wolf said. Sand Wash is a special case among designated wild horse areas in the American West. SWAT, in cooperation with the BLM, trains and fields volunteers to shoot darts containing a temporary sterility drug into selected wild mares at Sand Wash. The advocate team also has an affiliate, the Great Escape Mustang Sanctuary and Training Center, which gentles wild horses after they have been processed by the BLM and then facilitates adoptions. In the fall of 2016, BLM’s Little Snake Field Office in Craig used a passive trapping technique, instead of using helicopters, to selectively remove 43 wild horses from the rolling sagebrush/juniper/piñon pine lands in Sand Wash by luring the horses into corrals with feed. Horses, which wandered into the corrals and could be identified as representing special bloodlines and hence genetic diversity in the herd, were turned loose. Courtney Whiteman, BLM spokesperson in Denver, told Steamboat Today on Aug. 2 that Acting BLM Colorado State Director Greg Shoop is very familiar with last fall’s plan to remove wild horses from Sand Wash without relying on helicopters, as well as the collaboration between his agency and SWAT. She said Shoop has shared that story across the agency’s wild horse and burro program. Wolf is especially pleased this summer at the success the BLM and her organization saw in improving two spring fed ponds in Sand Wash that are important not only to the mustangs but to the sheep that graze in the same area. The ponds have been enlarged to contain 1,000 gallons of water each. Wolf said the pond improvements were undertaken with the approval and help of area sheep rancher Steve Raftopoulos. That said, federal policy toward wild horses, which costs scores of millions of dollars to remove the animals from the range and pasture elsewhere, could be poised to change. Historically, Congress has blocked wild horse slaughter by rejecting a provision in a funding bill that requires funding federal employees to oversee slaughterhouse operations. Wolf said that although she’s strongly opposed to slaughtering the horses, if it’s going to happen, she would prefer that it took place in well-supervised domestic slaughterhouses rather than in Mexico, for example.